When it’s time for St. Patrick’s Day, it’s fun to feel a wee bit Irish, even if you’re not. So if you’re having a party, you’ll want to have some festive St. Patrick’s Day Drinks to help you celebrate. Frankly, these are some fun drinks to serve that day even if you’re not having a party. 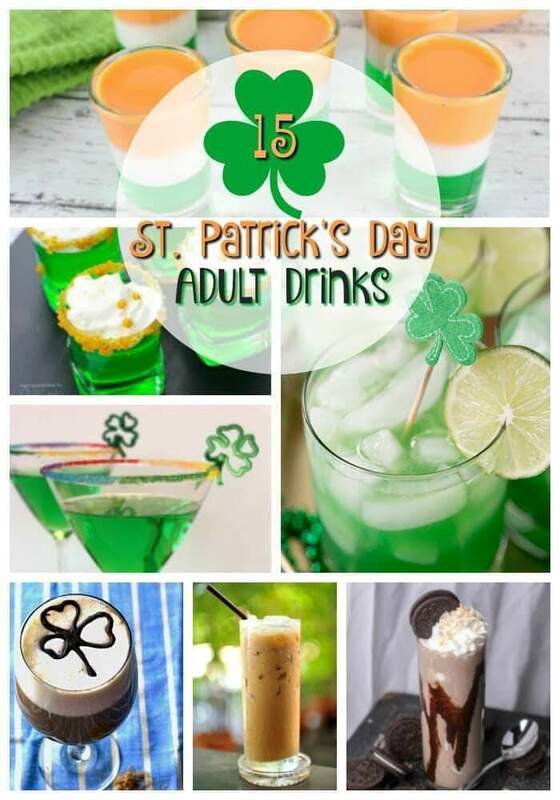 While you can’t go wrong serving some green beer or Irish coffee, why not branch out and serve some fun themed drinks? We’ve rounded up some of our favorite recipes to make hosting your event easy. And even if you’re just making a drink or two, they are still a lot of fun. So whether you’re craving something with some delicious Irish whiskey, looking for some green jello shots, a green martini, a delicious drink made with or something rainbow themed, we’ve got you covered. We’ve updated the post to include more than 15 great St. Patrick’s Day cocktail recipes! Irish Buck – Kleinworth & Co.
We have some more fun green cocktails here at Champagne and Coconuts that aren’t St. Patrick’s Day themed, but if you leave out the styling for a different holiday or occasion, no one will know. They are such delightful cocktail recipes with a perfect green color. Our Holly-Day Jello Shots are the perfect green jello shots for serving for St. Patrick’s Day. Simply Omit the red hots from the recipe to make them work for St. Paddy’s Day. Our Pistatachio Pudding Shots will also work for St. Patrick’s Day. Made with creamy pistachio pudding and vodka, they will help you celebrate in style. If you use a green sugar rim rather than a red one, no one will know that our Lime Ice Cream Float isn’t custom made for St. Patrick’s Day. We have a delicious rum and blue curacao cocktail that’s a perfect shade of green to serve for your St. Paddy’s party. A sparkling green apple martini is always fun for a party too! 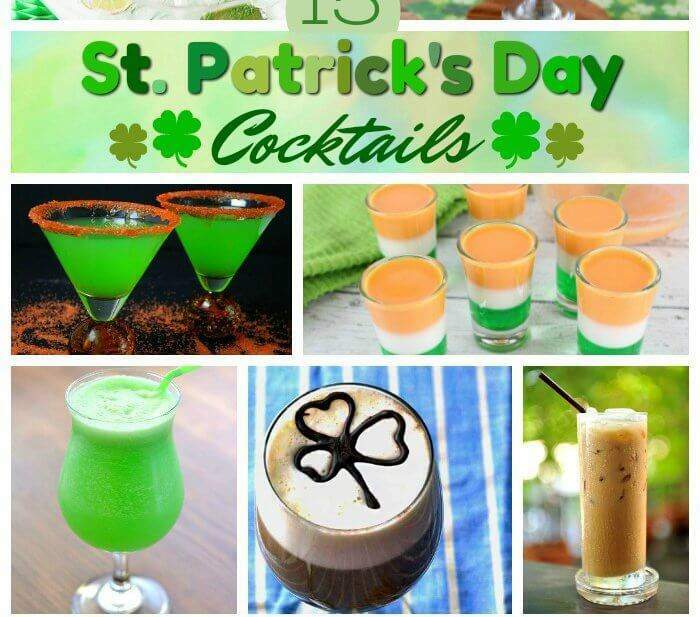 Please let us know how you enjoy trying some of these festive St. Patrick’s Day drink recipes. If you make one yourself, please let us know on Pinterest that you tried it and tag us with #champagneandcoconuts on your Instagram photo. If you haven’t had a chance to make it yet, be sure to save the recipe on Pinterest so you’ll remember where you found it. 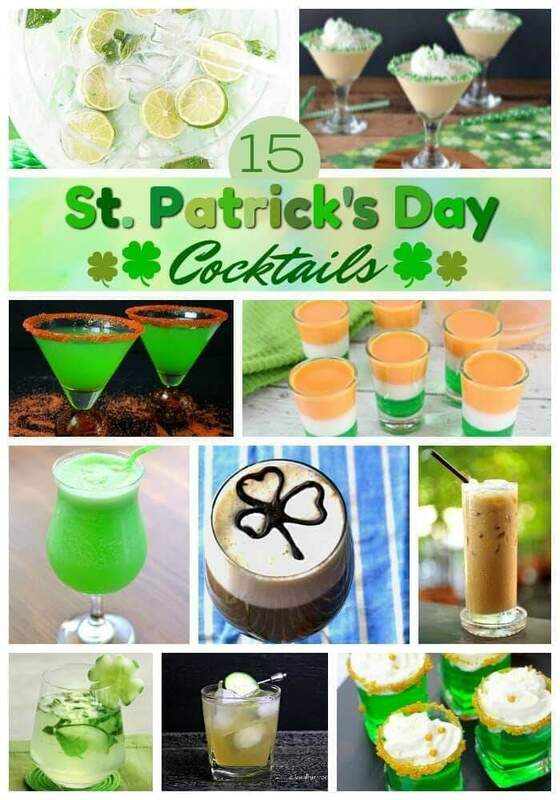 You may enjoy following our Pinterest Boards, Holiday Cocktail and Mocktail Recipes, and St. Patrick’s Day Cocktail and Mocktail Recipes. Disclaimer: Never use blogger photos without permission. The Virtual Assistant (Nicole) who prepared this post obtained permission to use the photos included in this article from various Facebook Roundup groups. Links were submitted by blog owners/representatives and are being used in accordance to the group rules.